On the centenary of the end of First World War, Academy Award-winner Peter Jackson (The Lord of the Rings trilogy) presents an extraordinary new work showing the Great War as you have never seen it. Using state of the art technology to restore original archival footage which is more than a 100-years old, Jackson brings to life the people who can best tell this story: the men who were there. Driven by a personal interest in the First World War, Jackson sets out to bring to life the day-to-day experience of its soldiers. After months immersed in the BBC and Imperial War Museums’ archives, narratives and strategies on how to tell this story began to emerge for Jackson. Using the voices of the men involved, the film explores the reality of war on the front line; their attitudes to the conflict; how they ate; slept and formed friendships, as well what their lives were like away from the trenches during their periods of downtime. 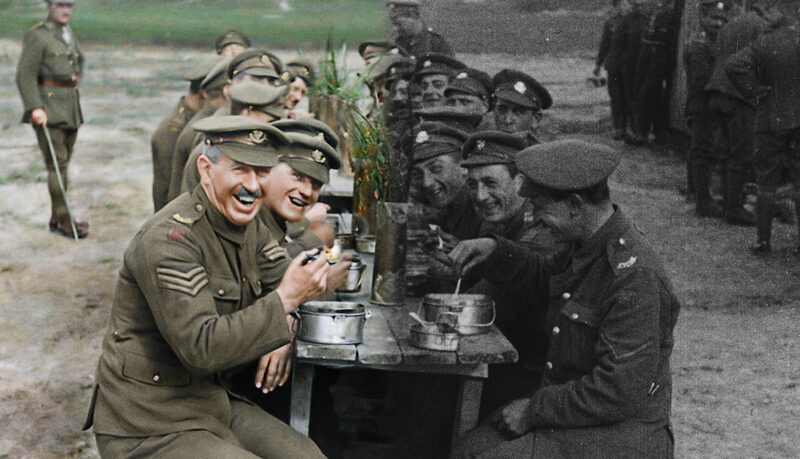 Jackson and his team have used cutting edge techniques to make the images of a hundred years ago appear as if they were shot yesterday. The transformation from black and white footage to colourised footage can be seen throughout the film revealing never before seen details. Reaching into the mists of time, Jackson aims to give these men voices, investigate the hopes and fears of the veterans, the humility and humanity that represented a generation changed forever by a global war. Co-commissioned by 14-18 NOW and Imperial War Museums in association with the BBC. Produced by WingNut Films and Executive Produced by House Productions. Special thanks to Matthew & Sian Westerman with additional support from The Taylor Family Foundation, The Moondance Foundation, Welsh Government, Scottish Government, British Council, Tim Bunting, Jacqueline & Richard Worswick and one anonymous donor.